In a lot of ways our trip to Taipei, Taiwan, was one of our best. It’s an amazing place. The culture is so different from ours that it’s striking. You can see and feel the magic the minute you step off the plane. I’d never been there before. And like I said, everything there was really neat but there was one thing that really stood out — it’s such a clean city. The streets are clean, the drainage ditches are clean and even the buildings are clean. It’s an example of what can be done when everybody pitches in and takes an issue seriously. I was really impressed. Beyond that, though, is the fishing. It’s fantastic. 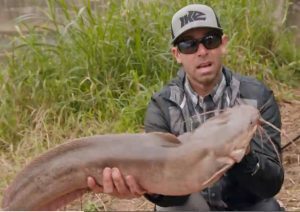 We fished different sections of a major river that runs right through the city for sea bass, African catfish and giant snakeheads. The reason we could catch all three species on our bucket list was because it’s got all three kinds of water in it. Up high, above the city it’s all freshwater, just like we have here in the States. As it flows down it turns brackish and then finally, at the mouth of the river, it’s all saltwater. (They call it brackish down there, too, but for my money it was salty.) We fished all three types of water while we were there. These things aren’t like the ones we have here. They’re much more aggressive and they look different. Their heads kind of look like ours but the back half of them looks like a snakehead. I know that sounds weird but to be honest they’re interesting to look at, and in a strange kind of way they’re really beautiful. We fished for them up in the river where the water’s fresh and we used two rod and reel setups. One was with cut bait and the other was with artificial lures. The cut bait thing was pretty much what you’d expect. Our rigs were basically Carolina style deals. We had a hook, cut bait on it, a sinker, a swivel and a main line running back to the reel. The tackle belonged to the guys we were fishing with so I don’t know much about it other than to say that it was heavy, serious tackle for serious fish. That’s a good thing because we caught one that weighed a solid 30 pounds. Believe me when I tell you that it put up one heck of a good fight. I’d have no hesitation in recommending you catch one or two of them if you ever get the chance. The artificial approach was unbelievable. We targeted them with topwater baits. One was a Rapala X-Rap Pop and the other was a Rapala X-Rap Prop. They liked their lures noisy on top. Our best color was perch even though there are no perch over there. The smaller sizes seemed to work the best. I fished with a 7 foot, medium action Abu Garcia Ike Finesse Spinning Rod and a 30 size REVO Ike Spinning Reel. 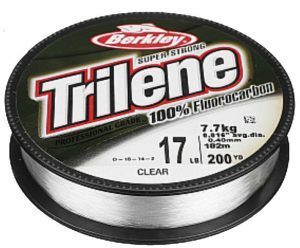 I used tough line for this technique — 20-pound-test Berkley X9 Braided Line. The fish we caught on topwater plugs weren’t as big as the ones we caught on cut bait but it was a hoot to go catfishing on top. I can’t say that I’ve ever done that before, and neither have very many other guys. We targeted them in the very lowest section of the river, right where it spreads out and is considered to be saltwater. It flows almost straight with a fair amount of current. We targeted the breaks and seams created by the bridge pilings. They were huge bridges with huge pilings. The locals fished with mostly metal baits. Some of them were jigging spoons but others looked like blade baits. 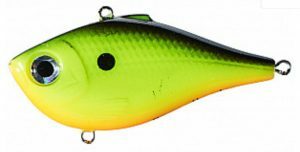 I fished with an 07 size Rapala Rippin Rap in chartreuse shad. It’s new and is it ever effective. It’s also big and heavy — 2 3/4 inches long and 7/8 of an ounce in weight. I wanted lots of noise and lots of vibration. Besides, I figured that they’d never seen a Rippin Rap before. I was right. They hadn’t. I fished it pretty much like you’d fish one around bridge pilings for bass. All I did was cast it out just past a seam where they were ambushing their prey, let it fall and then jig it back to me — up and down, up and down. 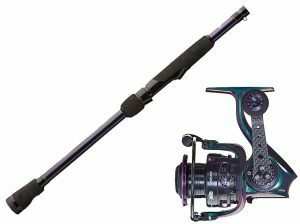 My rod was a 7 foot, medium heavy Abu Garcia Ike Power Casting Rod with an 8.0:1 Abu Garcia REVO Ike Casting Reel spooled with 15-pound-test Berkley Trilene 100% Fluorocarbon. My best sea bass was a 20 pound (plus) beast that put up a serious fight after it was hooked. The interesting thing about this species is the difference between how it’s viewed in the United States and how it’s viewed in Taiwan. Here we think of it as an invasive species. We don’t want to see one, much less catch one. But over there it’s a revered fish. 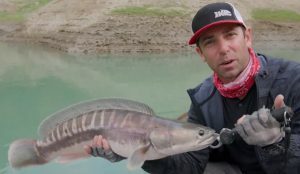 It’s like our largemouth and smallmouth bass to a Taiwanese angler. They fish for them all the time and take great pride in their catches. And, like our bass, they are under a lot of fishing pressure. It’s really cool to see another culture do the same things we do except with a different species of fish. 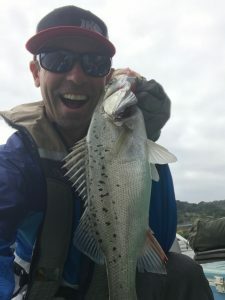 It proves my point that all anglers are basically the same inside. We fished for them way up in the river, past the dam, where there’s a reservoir. Pretty much like what we all fish over here. Giant snakeheads are very aggressive and very smart. The first day I didn’t catch any but I did have a couple of blowups. They feed up so all of our offerings were topwater lures. I realized that night that whenever I speeded up my lure they would attack. That’s when I got the blowups. And so, with limited time the next day, I decided to crank things up a notch or two and go for broke. I fished a Rapala X-Rap Pop on a 7 foot, medium heavy Abu Garcia Ike Power Casting Rod with a 8.0:1 Abu Garcia REVO Ike Casting Reel. My line was 40-pound-test Berkley X5 Braided Line. But the real way I caught them was with a frog — a Molix Sneaky Frog in pure white. I’d throw it out as far as I could and then crank it straight back real fast with an occasional twitch. They absolutely killed it. I fished my frog on a 7 foot, 2 inch Abu Garcia medium heavy Ike Power Series Casting Rod. My reel was a high-speed (8.0:1 gear ratio) Abu Garcia REVO Ike Casting Reel. 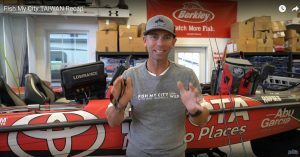 I spooled up with straight Berkley X5 Braided Line, 40-pound-test. I said just a minute ago that the frog was the real way to catch them. Here’s why I said that: I caught one that weighed 38 pounds on the frog and tackle I just described. It took me between 25 and 30 minutes to get it in and under control. That was an experience. 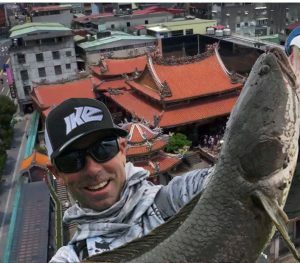 Fishing Taipei for sea bass, African catfish and giant snakeheads was the experience of a lifetime. I can’t tell you how much fun I had. If they had tournaments for those things, I might consider a career change. They are that much fun. Watch “Fish My City TAIWAN Recap.” Click above.